Baby woodrose, photographed at Delray Oaks Natural Area, Delray Beach, Palm Beach County, in March 2017. Baby woodrose, Merremia dissecta, is one of those plants that catches your eye even when not in bloom. Those intricately patterned leaves just stand out. This spectacular member of the morning glory family is found throughout most of Florida and the Southeast as far west as Texas. It's also found in Philadelphia County in Pennsylvania, according to the United States Department of Agriculture. There's also some debate about whether baby woodrose is a Florida native. Some sources say yes, some no, but the trend seems to be favoring the affirmative. More on the debate in a bit. Baby woodrose is a perennial twining vine that can reach lengths of eight to 10 feet, by some sources, 18 to 20 feet by others. It has deeply lobed leaves, usually divided into five "fingers," each of which is heavily and deeply "toothed." 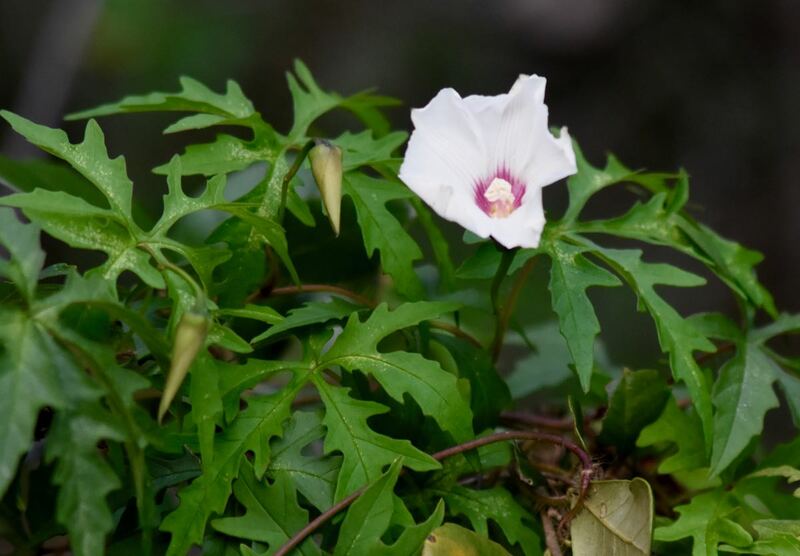 The flowers are large, about three inches across, trumpet shaped like morning glories, generally, mostly white with a red-to-purple throat. They bloom spring to fall and attract butterflies. it is cultivated, grown for the flowers and foliage but it can be aggressive and not suitable for all situations. Favorite habitats include open areas, disturbed sites and stream banks it likes full to part-sun and is drought tolerant. Baby woodrose is found throughout the Caribbean, Mexico, Central America and South America. In fact, it's found in warmer places around the globe. in Hawaii, where it's native, baby woodrose has multiple uses in the traditional medicine cabinet. In various forms and combinations, it's used to relieve back pain, treat flesh wounds and broken bones and as a laxative. Mothers and infants chew the flowers as a strengthener. In other places, it's used as a sedative, a remedy for giddiness (we did not make that up), snake bites and in toxication. It's used as a wash to treat scabies and relieve itching. It's also used to treat urinary tract infections. The leaves of baby woodrose manufacture a group of chemicals called cyanogenic glycosides, which are extremely toxic but also found in a variety of plants, including some that we eat (almonds and apricots to name just two. In small doses these chemicals can act as muscle relaxants. 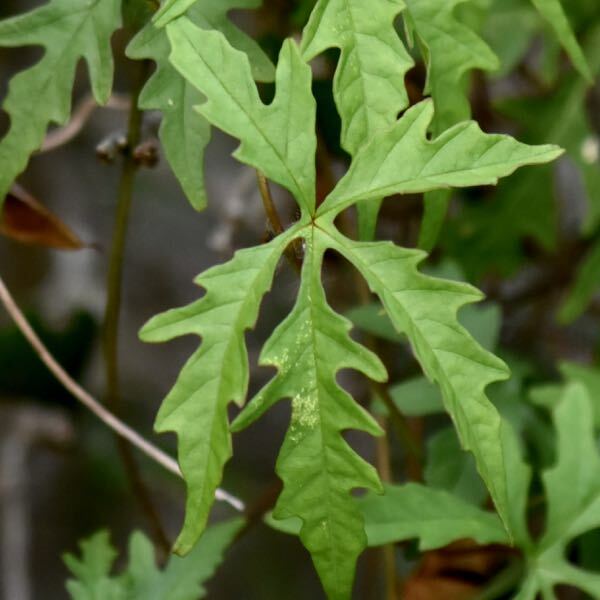 Many naturalists, including the Institute for Regional Conservation, have classified baby woodrose as naturalized plant, a non-native that's made its way into the wilds of Florida. Others, including the USDA, have classified it as native. According to the University of Florida's Center for Aquatic and Invasive Plants, the late Daniel Austin, perhaps the state's best-known ethnobotanist changed his own opinion about whether the plant was native to the affirmative based on two factors: it's native everywhere within the Caribbean region and that two naturalists described finding the plant at two undisturbed sites in Florida during the 1770s. Baby woodrose is also known as noyau vine, alamo vine and cutleaf morning glory. 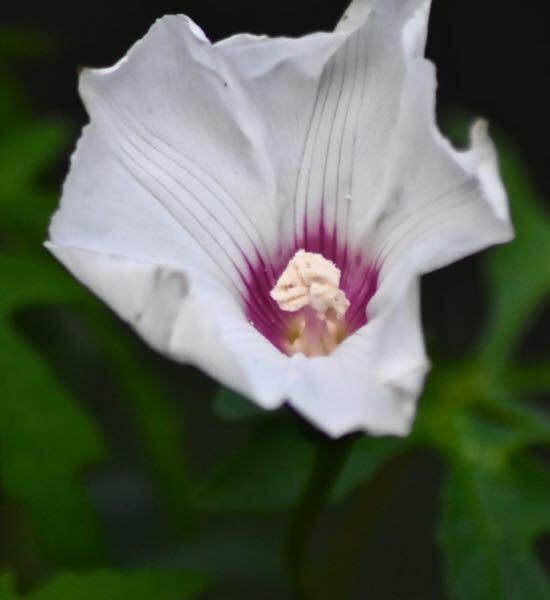 It is a member of Convolvulaceae, the morning glory family.